Full contact horror is coming to NYZ this holiday seasons! Best known for zombie survival experiences, NYZ Apocalypse also does full contact optional survival horror experiences that are interactive, immersive, and way scarier than a normal haunted house. 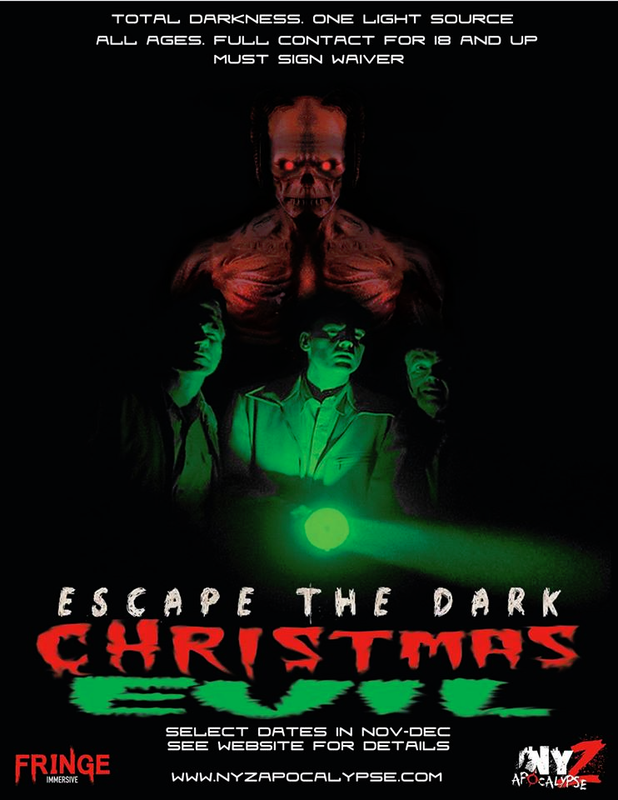 Escape the Dark: Christmas Evil is a Survival Horror Escape House set in an abandoned prison where a secret society called The Cult of Yule has summoned the Christmas demon Krampus to punish humanity and destroy the world. The summoning is a success and it creates a blackout; now Krampus has possessed several of the cult members and they have become horribly disfigured to look like demonic elves and Santa Clauses. Armed with but a single flashlight, your mission is to infiltrate the wicked Cult of Yule, gain their trust, complete their initiation process, and take down Krampus. Whatever you do, don't blow your cover or else you risk becoming a sacrifice to the Christmas demon. 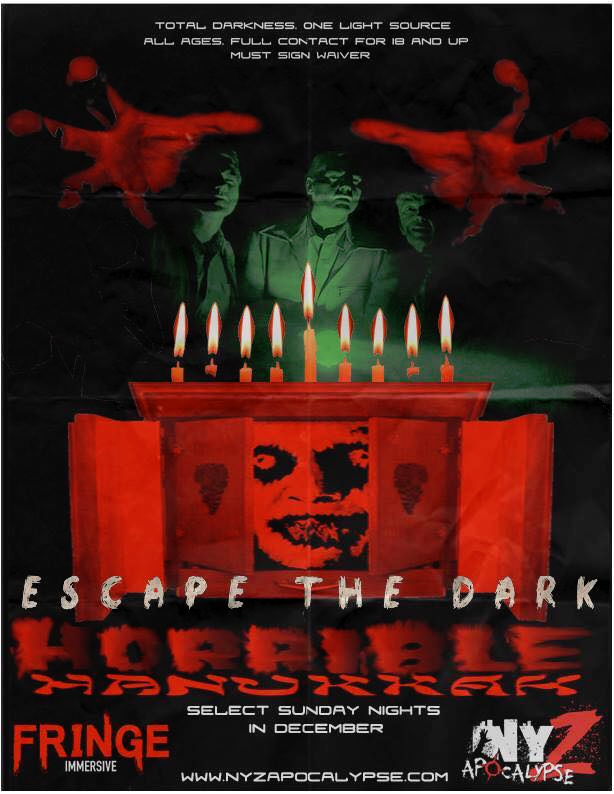 Escape the Dark : Horrible Hanukkah is a Survival Horror Escape House set in an abandoned prison. It is the last night of Hanukkah and you and your team is sent to the underground prison so you can rescue a Rabbi who is exorcising a Dibbuck from the body of female inmate. The Dibbuck's spirit is so powerful that it causes a power outage and it has now possessed several of the other inmates and have become horribly disfigured. Armed with only a single flashlight your mission is to infiltrate save the Rabbi and the girl, or risk being possessed yourself! The wildly popular Netflix series Stranger Things is actually based on real events. Montauk NY's now defunct military base, Camp Hero, was the location of strange government happenings like controversial mind control programs, time travel, kidnapping, experiments with inter-dimensional portals, aliens and more. 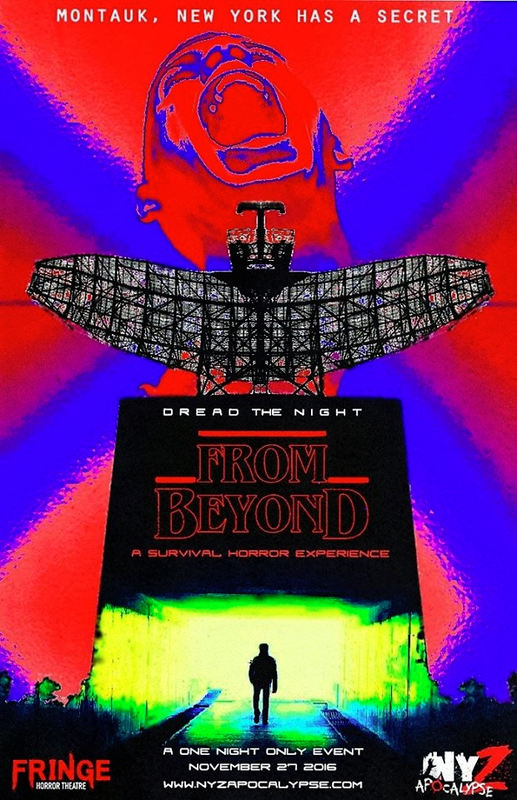 FROM BEYOND is an intense, immersive, interactive, survival horror experience which is not meant for the faint of heart. It deals in subject matter based on real events, and may cause you to question your sanity. You and your team are private investigators who have been hired by the Aurora Institute and are being sent into an underground prison where the Montauk Project's most twisted experiments were relocated for safe keeping. Your mission is to uncover the truth about what happened in Montauk at Camp Hero and what sinister plot is unfolding now in the mysterious Apollo Prison. Each teammate has a specific job and will be given specific items to complete his or her task. Groups will be no bigger than four people. This event is full contact; you must sign a waiver. For more information and tickets, visit their website. The Scoop on Flu Season, Winter Recreation, News & More in January 11th's Newsletter! New Year's Celebrations & Happenings, Weekend Fun, News & More in December 28th's Newsletter! Subject: LongIsland.com - Your Name sent you Article details of "NYZ Apocalypse's Holiday Horror Brings Scary-Good Fun to Long Island This Holiday Season"